The Amish Mission Homestead Corner Desk with Optional Hutch Top is both gorgeous and functional. 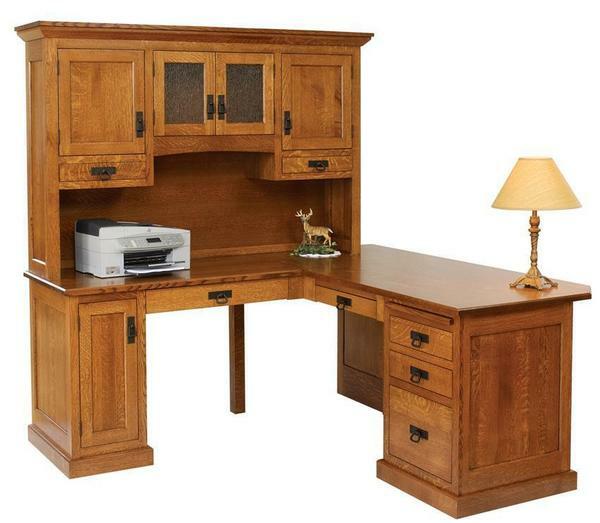 Our Amish Mission Homestead Corner Desk comes standard with plenty of storage and workspace. Elect to customize this handsome desk with a hutch top that offers three additional cabinets and two drawers. Your desk defines your workspace. With the majority of your workday spent behind it, our solid wood furniture provides the most comfortable, most functional and most beautiful options just for you. One look at this beautiful solid wood desk and you will feel motivated to put in your day at the office. Be sure to consider our helpful blog post, "8 Office Desks That'll Get Your Job Done" for information on desk styles and functions. Review our extensive line of Amish Desk Chairs to find the one you love best. This solid wood desk comes to you from a woodshop in Ohio. Each desk is subjected to a three-step sanding process to create a silky smooth surface for the stain of your choice. Customize the main element for your solid wood office furniture collection and enjoy a productive day! Call one of our Amish Furniture Specialists today at 1-866-272-6773 with any questions.